We are excited to share our newest and improved widgets in our seventh edition of widget news. Many of these widgets came from your suggestions and feature requests, so keep them coming! The fundamental model of a form, whether electronic or otherwise, is to ask a question and expect an answer. So in all forms, there is always a question (which does not necessarily have to end with a question mark! ), and its always expected that answers will come through. One of the reasons why form users do not submit answers (or submit inaccurate responses) is because the question is convoluted or complicated or perhaps vague or not clear among other reasons. 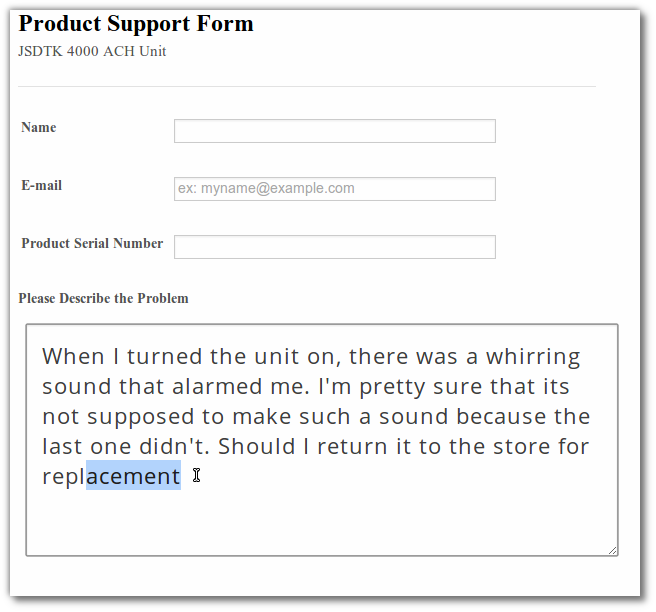 Basically, the question needs to communicate to all your form users what you want them to respond to; that can be a difficult feat. This is one of the reasons why Widgets are so popular with many of our users - they 'un-complicate' almost all questions, by that making the purpose of a form clear. We have widgets that use images, animations, mathematical calculations, auto-completions, third party applications, themes and styles, all meant to make the question clear, simple and straightforward. This allows you to efficiently collect accurate answers each time. Go ahead and see what we have in store in the widget gallery. If you don't see what you are looking for, please tell us about it; we want you to make great looking, efficient and accurate forms. Here's What we have for you this week! The Square Radio Button Widget has been updated with cool new buttons, highly customize-able by changing the color, the font type among other styling features. The widget controversially moves away from the traditional round radio buttons, and adopts a more soft, square appeal. This gives structure and beauty to your form. Go ahead, give the Square Radio Buttons a spin. It can be annoying sometimes, trying to figure out which system of measure to use - Metric or Imperial. Why not have your users fill in their answer with whichever system they see fit? The Height Widget is as smart as a whip! It will allow the user to select which system of height measurements , and then convert whichever value is entered to whichever system you prefer. Cool huh? 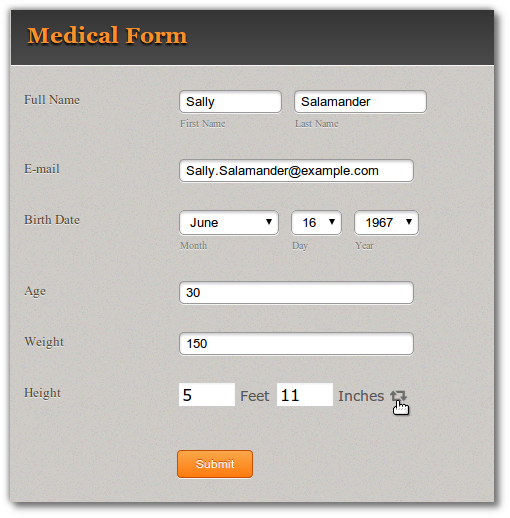 Add the Height Widget to your form and see it in action! The Liquid Volume Widget removes the need to convert volume measurements between Metric or Imperial Systems. Let the user decide what system they would rather use. The widget will accurately convert the values and present them to you in either system, making it easy for your form users, and also collects precise and correct values from your form. Its quick and easy to add this widget to your form; give the Liquid Volume Widget a try. 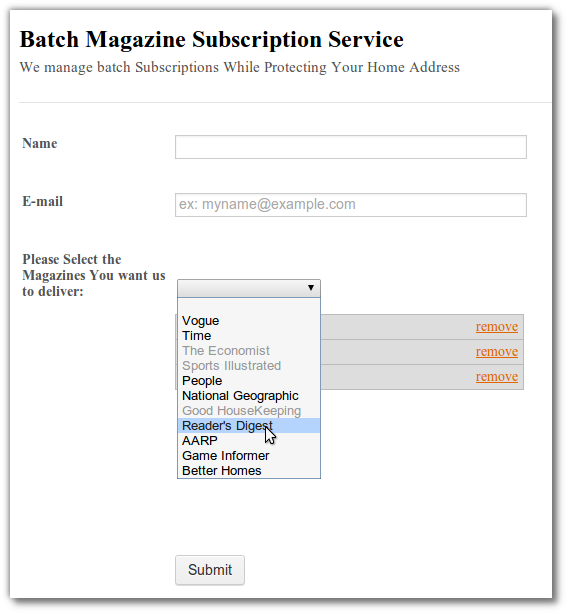 It may appear trivial, but its pretty hard for your form users to enter their location or an address on your form. This is why we have lots of widgets that help your users accurately respond with the correct address. If your form is targeting an Indonesian audience, then you've struck gold. The Cities of Indonesia Widget contains a comprehensive list of Indonesian Cities - yes, comprehensive. All your form users have to do is select the correct State, then the correct City from a drop down box. Give the Cities of Indonesia Widget demo a spin and see what the widget can do. The Airport Picker Widget is a drop-down field;but unlike other drop downs, it contains a complete list of all the airports in the world. Not only that, you can search each airport by location or country, and the widget will list the airports in that area that your form user can pick from - Now that's a cool widget! We finally implemented one of the most requested widgets. The Facebook Like Box widget is based on the Facebook Like Box Plugin. 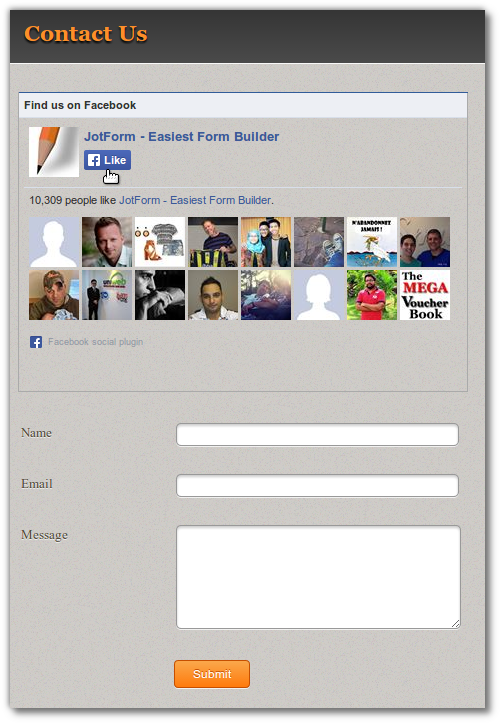 This allows your form users to like your Facebook fan page - right there on your form! Its easy to configure - just add the link to your Facebook Fan Page, save the settings and voila! See the Facebook Like Box Widget in action. It may seem like an obscure feature, but it will surprise you just how useful this widget is. This is primarily because its hard to convert numbers between different number systems (Decimal, Hexadecimal, Binary, Duodecimal among others). With this widget - its as easy as pie. Your form users can select which number base they are using to enter the value, then the widget does the rest. Add the Bases Widget to your form now and see the results! One of the easiest forms of communication is through images. This widget harnesses this powerful method of communication with your form users. Have you ever had a bunch of images that you want your users to pick one from as their answer? If yes, then this is the widget you have in mind. The Image picker allows you to upload your images, then it organizes the images in a grid, which your users can click on to select the image they have in mind. Try the Image Picker Widget for yourself and see how powerful your form will be. Many of our users are non profit organizations, and we enjoy working with them in making the world a much better place - beyond that, we pay attention to systems that help raise funds for such noble causes. An effective way of raising funds is through the Matching Gifts Program, which is a popular way for corporate entities to work with their employees in making donations. The widget is designed for the Double the Donation plugin, which will give your users access to a comprehensive database that helps help them make decisions based on the Matching Gifts Program. If you have a Double the Donation account, go ahead and use their proprietary plugin on your form using the Double the Donation Widget. Its important to involve your users in improving your product or service. 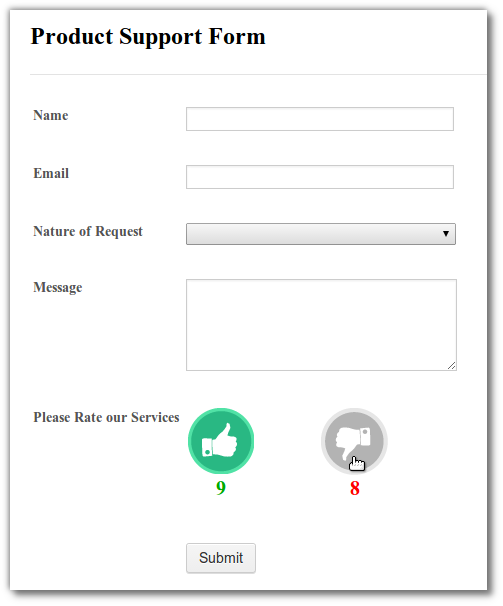 The Like and Dislike widget allows you to do that by placing like/dislike buttons on your form, which you can use to collect and display information on what all your form users think about your service or product. If you are keen to improve your product everyday, then this widget will definitely help. Add the Like and Dislike Widget to your form and test it out. 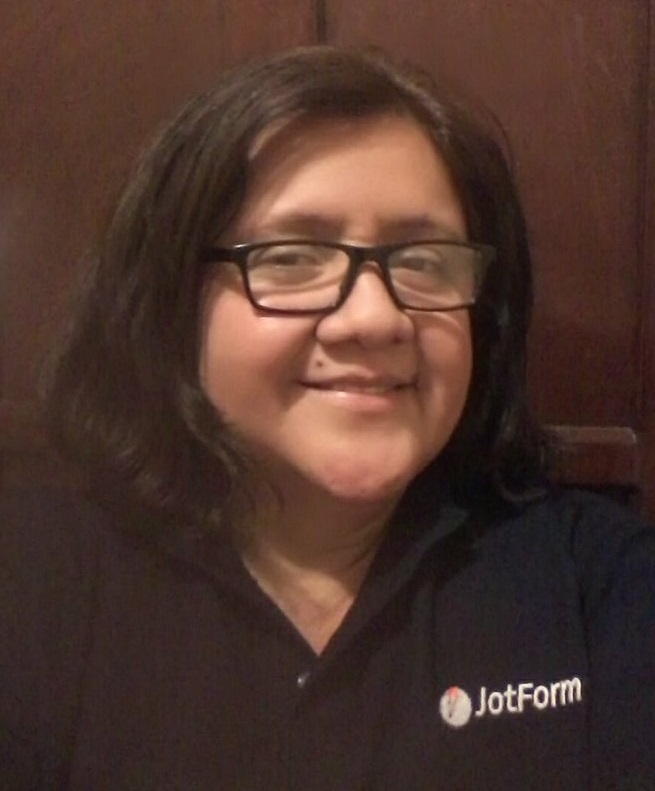 You have a test you want to give your form users? 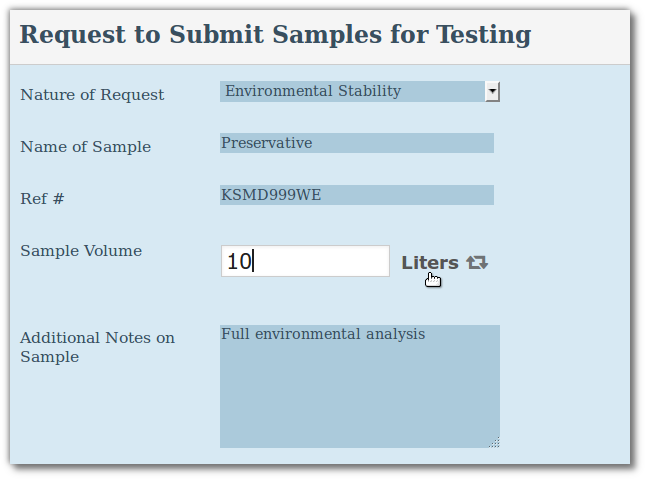 This widget will certainly spice up your evaluation/test form! 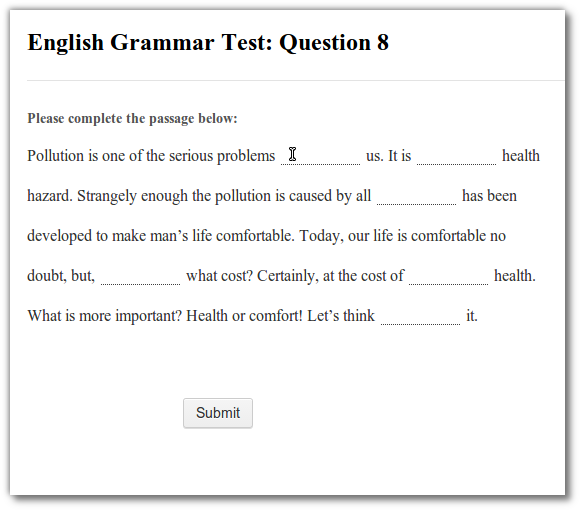 The Passage Test Widget presents your question as a passage or narration containing blank spaces for your users to fill. Not only that, you can instruct the widget to evaluate whether the answers were correct, and it will give a pass/fail to each answer. 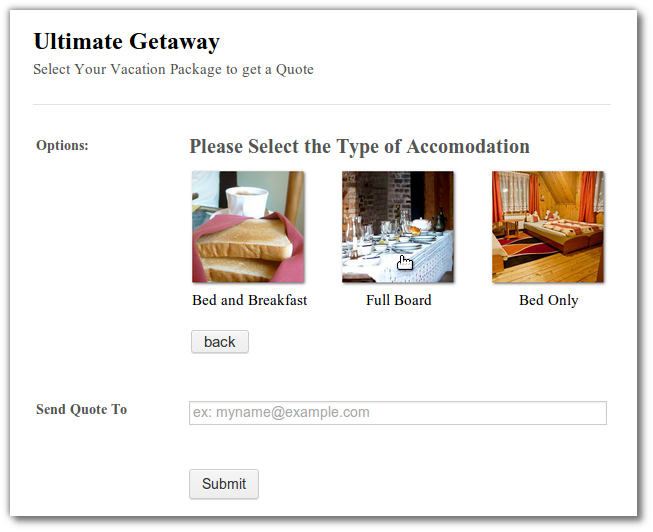 The Passage Test Widget is bound to make your evaluation process a breeze, so go ahead and add it to your form. Its always a hassle trying to figure out what time zone you are in. If that is true for you, then it's just as difficult for your form users. 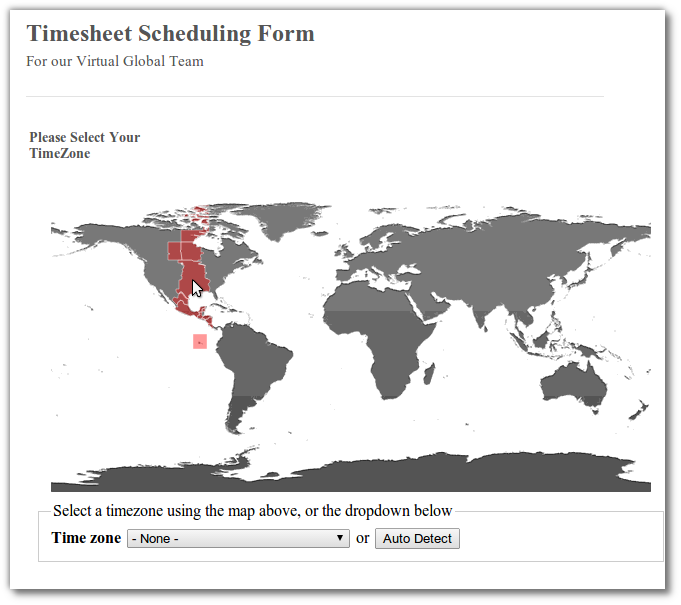 The Timezone Picker is basically a Global Map, which lets your form users to select their timezone by clicking on their country to get the correct time-zone for that location. The Timezone Picker Widget is ready to use with a beautiful array of themes you can select from - give it a try! Don't let the technical name throw you off, this is the smartest Drop-Down Widget yet! 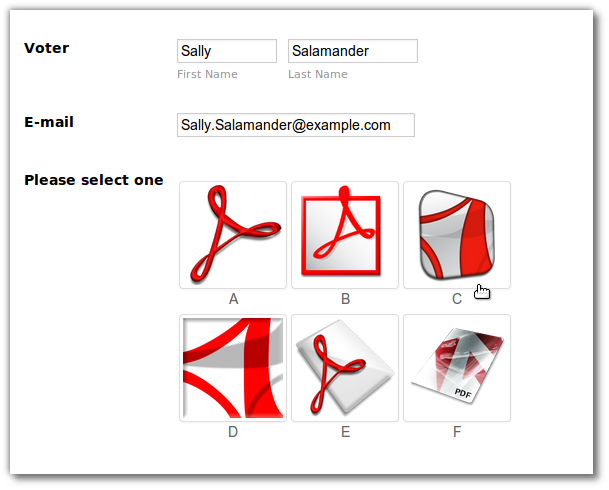 Based on the asmSelect Jquery plugin, this widget allows your form users to select more than one option from a drop-down box. Not only that, they can go back and un-select their choices if they change their minds. It sounds like an App all by itself, doesn't it? Give the AsmSelect Widget a try and see its features for yourself. This widget is named after the AutoJS library which powers its incredible features. Hold on to your hats: It predicts what you are going to type next. No, I'm not kidding :-) Give the AutoJS Widget a spin and see for yourself! Do people like your product or service? Have they sent you emails or letters to thank you? Then let your other customers or form users know. The Testimonials Widget allows you to showcase the testimonials you have received because of your excellent service and/or high quality products. Its pretty easy to set up - all you need is the image, the testimonial text and a Title. 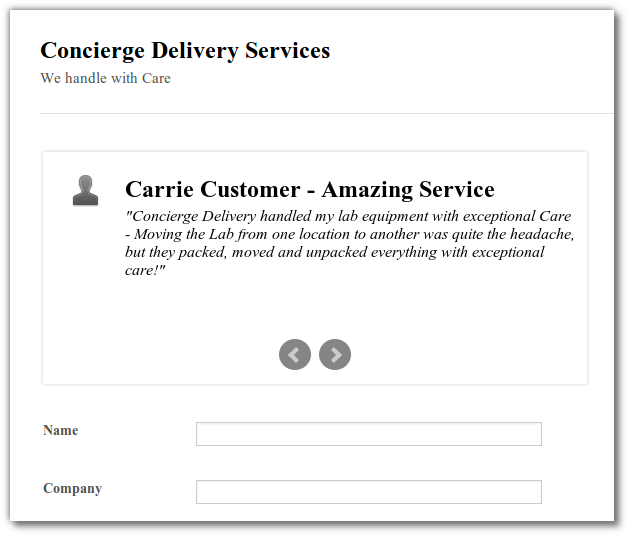 When you add the Testimonials Widget to your form, you will see that we have included sample settings to get you going. Last, but not least is the Image Choices Widget. We agree that pictures say a thousand words, right? If so, then let your users respond entirely to a series of image choices. When they select an option by clicking on an image, another set of choices shows up that they can keep selecting from. When words are not enough, use images, and get the answers your users intended to give. We have prepared a demo for the Image Choices Widget, please check it out. We missed last week's issue because we are shifting tactical gears - sorry about that. Our current goal is to respond effectively to your suggestions about the widgets in our gallery - improving, fixing, upgrading and perfecting. Why? Because we want you to build great forms; friendly, beautiful, powerful and efficient. I love these reports. Although I am in the internal widgets mailing list, many times, I found out about a new widget thanks to these lists. Thank you for taking the time to explaining each widget in detail and providing great screenshots. Its a lot of fun testing the widgets in various scenarios, and extrapolating the purpose of each widget - sending it back and forth the Widget Team as we polish it for production - great fun. Thank you Titus and Widgets team for always keep us and our beloved users informed. These new widgets and the enhanced ones keep up JotForm rocking!